This is a delicious alternative to the standard take away. It takes a few extra steps and some extra lovn', and the results will be worth it. 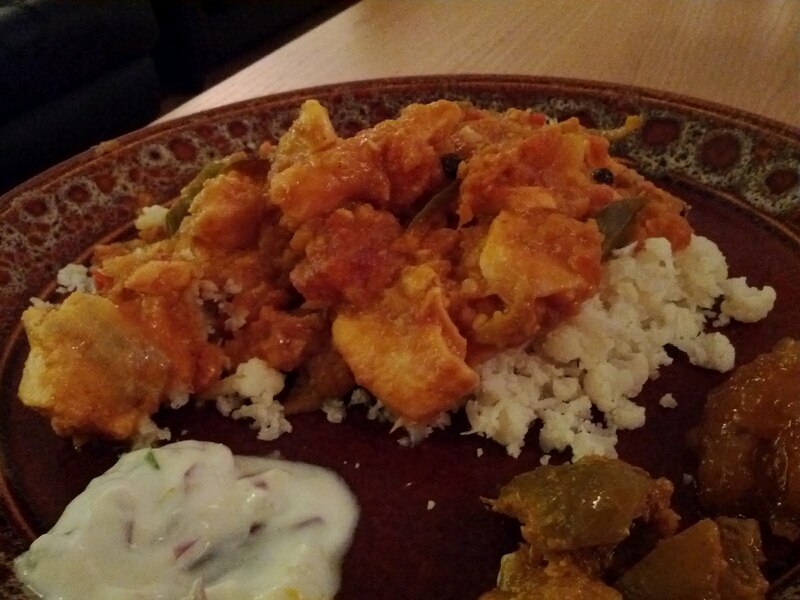 It's a delicious delicate fish curry unlike some of the standard sauces you get at local takeaways. I adapted this recipe from a 'do it yourself' curry box, and I think it came out even better. By the way I think chicken or turkey would work perfect with the flavors as well as fish. Enjoy. Toast the spices, cinnamon, peppercorns, cumin seeds, cardamom, cloves, coriander, ground cumin, turmeric, chili powder on a low heat until they become fragrant. Immediately take off heat and place in a bowl. Next in a food processor puree the onion, ginger, and garlic. Set Aside. Add oil back into the pan that you toasted the spices, when hot add the puree and cook stirring constantly for 5 minutes. Next add the toasted spices, stirring and cooking for a further couple minutes. Next goes in the creamed coconut shavings, until melted. Then add the tomatoes and curry leaves bring up to a boil until everything is combined. Simmer the sauce for about 30-45minutes, stirring occasionally. Make sure there is no skin on your fish. Cut in chunks about 1-2 inches. Gently lay the fish in the sauce and move around until covered by the sauce. Turn the sauce down to low, and simmer for 5 more minutes or until the fish is firm and cooked. Once finished serve over rice, or for low-carb alternative cauliflower rice, enjoy!